While certain comic book narratives have already been adapted into various film franchises, televised cartoons, webcomics and interactive experiences, the emergence of the motion comic has further transformed the relationship between the comic book medium and moving image culture. It does so by directly appropriating the narrative and ‘static’ comic book artwork of the hypotext, which is then manipulated by animation software such as Adobe’s After Effects to create an impression that is similar to paper-cut animation. Early examples of the form include the episodic web-based Broken Saints (Dir. Brooke Burgess, 2001-2003), as well as Saw: Rebirth (Dir. Jeff Shuter and Daniel Viney, 2005), an adaptation from a one-off comic book title that acted as a prequel to the Saw narrative in the live-action films. There is a great deal of diversity in production approaches, including cinematic forms that attempt to emulate more orthodox forms of animation, to reconstructed motion comics that use comic book systems such as multiple panels, gutters and speech balloons to convey narrative. To illustrate some of the unique properties within motion comic practice, an example of comic book to motion comic adaptation is provided in the following section. Original comic book artwork and animation stills have been appropriated to highlight some of the nuances of motion comic form. 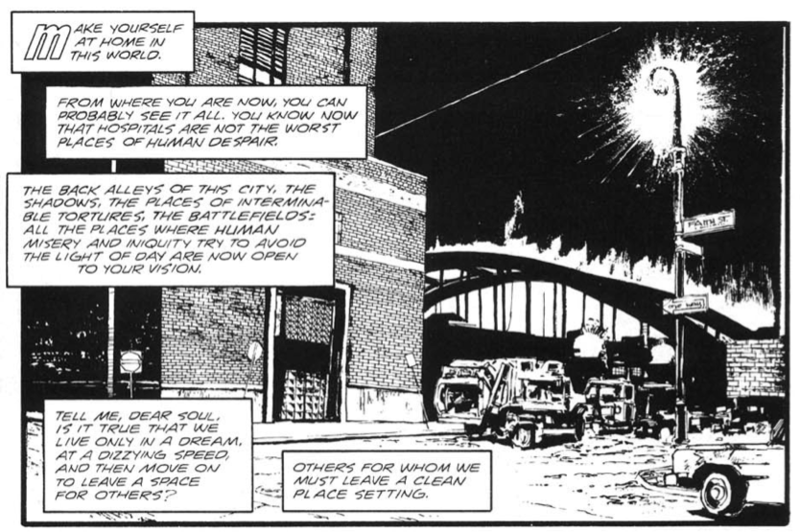 The first image reveals an individual comic book panel from Batman: Black and White – Perpetual Mourning (1996) by writer and artist Ted McKeever. It depicts a grim inner city environment, complete with a solitary building, garbage truck, street light and a bridge silhouetted in the distance. A noirish inner monologue, revealed in narrative text boxes, sets the tone for this particular story. McKeever has utilised classic pen and ink techniques to render this introductory scene in stark black and white with contrasting areas of dense black space and lighter details, such as the brick façade of the solitary building. McKeever has also used white ink or paint to create a harsh area of white light around the lamppost light. This particular scene provides most of the necessary visual data for the resulting motion comic adaptation, but certain measures have been taken to adapt this artwork into a moving sequence. The resulting cinematic motion comic adaptation of this particular scene reveals some of the unique aspects of animation practice within the motion comic field (Figure. 2). The opening image of the lamp reveals the digitally scanned pen and ink imagery of McKeever, however a post-production digital lighting effect has replaced the white area in McKeever’s original artwork. The virtual camera slowly pans down the lamppost, revealing the street name before slowly zooming out to reveal the bridge. Image four in this sequence is of particular interest as it reveals parts of the bridge that were previously obscured by McKeever’s original static comic book rendition of the scene. This highlights another aspect of motion comic practice, namely the rendition of additional visual imagery to facilitate the movement of the virtual camera around the scene. Finally we zoom out to a position that mimics McKeever’s original panel drawing. This particular scene lasts thirty-three seconds and features a voiceover, in place of the comic book’s narrative text boxes. The dialogue in the original comic book panel has been narrated verbatim by voiceover artist Michael Richard Dobson, which influences the pace of the unfolding animated sequence. This is common practice throughout many examples of motion comic practice. The comic book text box, speech balloons and panel layout are replaced by a screen-based cinematic narrative, rather than reconstructing separate elements such as panels and speech balloons as supplementary forms of communication. By examining the following static panels from the comic strip, and then comparing them with the adapted scene in the motion comic, a distinctive form of character motion employed by director Ian Kirby and his team becomes apparent. The following comic book panels reveal Batman studying the hand of the murder victim. On this occasion the emphasis is on the examination of the hand, which shows evidence of the victim’s struggle, rather than a lengthy monologue. McKeever’s contrasting ink techniques once again display rich and dense areas of black tonality, as well as much finer line work. The resulting motion comic adaptation (Figure.4) continues the slow methodical pace established by the opening scene. This languid form of animation is in stark contrast to the pace of action usually depicted in superhero cartoon adaptations. Slow camera pans, zooms and instances of shallow depth of field are employed to add specific areas of focus, spatial depth and movement. The framing of the animated scene with its aspect ratio of 1.78:1 is also markedly different compared to the comic book panel in Fig. 10, which has an extreme wide-angle aspect ratio of 3.82:1. The result is a cropped section that necessitates the loss of some detail around the sides of the original comic book artwork. The voiceover dialogue and soundtrack are particularly ominous and add weight to the gruesome violence and sense of death in the morgue. 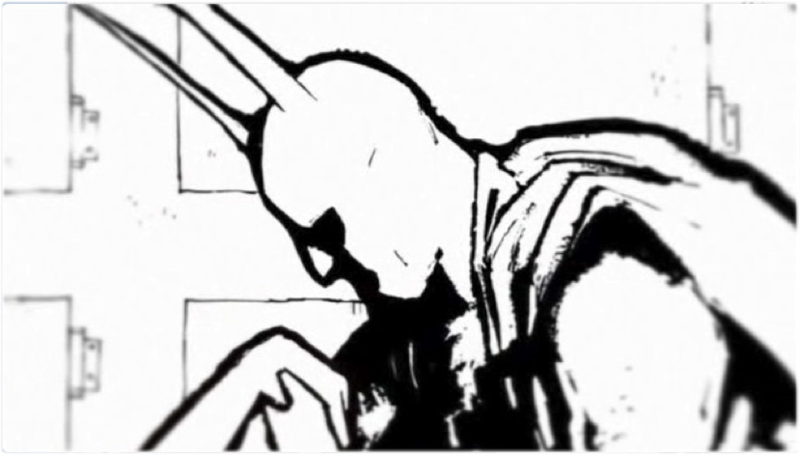 Slow pans and the tilting of Batman’s head as he draws the dead woman’s hand closer for inspection, is sourced from a static image and then manipulated in post-production in a form of digital paper-cut animation. The close-up examination of the battered hand also shows some minor bending and jointed movement from a static image source, rather than a conventional frame-by-frame approach to rendering motion. These brief examples have demonstrated some of the fundamental properties of the motion comic, illustrating their unique approach to conveying a comic book narrative in a digitally animated format. The majority of these motion comics follow a cinematic approach that subsumes conventional comic book layout (with speech balloons, panels, gutter space etc. ), into a cinematic mise en scène. However, the rich diversity of production processes within reconstructed forms of the motion comic, arguably provide a strong platform for further expression and creativity. Transmedia tie-ins (such as the 2013 motion comic for Mad Max), independent, and fan-made motion comics such as The Death of Spiderman (Lawson and Bates, 2011), suggest that the future of the motion comic may be sustained by even greater hybridity between the comic book form and animation practice. I think one aspect to motion comic vs animation (“toon”) is that there are many current comic books that are wildly unsuitable due to content for children, but animation is still seen in the anglosphere as a “kid’s medium”. The desire therefore is to “elevate” or separate an adult medium (current comics) from a children’s medium (animation) whilst still trying to literally animate or breathe life into the static sequential art of a comic hypotext.